"Viking adventure on the high seas." Einarr Stigandersen is the dispossessed prince of Raenshold, his father its landless Thane. They sail from port to port, leading a vagabond's life aboard the longship Vidofnir, until a fateful battle with a demon ship and an unnatural storm send them reeling to Kjell Hall. A princess' beauty and the Jarl's wrath soon conspire to send Einarr on a series of impossible quests. 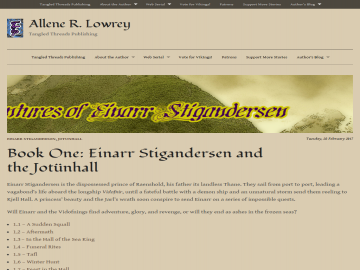 The Adventures of Einarr Stigandersen - Einarr Stigandersen and the Jotünhall has not been reviewed yet. The Adventures of Einarr Stigandersen - Einarr Stigandersen and the Jotünhall has not been recommended yet.